A Norwegian vessel that is likely transporting frozen fish from occupied Western Sahara could be on thin ice. In three days from now, 'Green Glacier' will enter South African waters - the jurisdiction that detained a stolen cargo from Western Sahara in 2017. On 23 February 2018, the High Court of South Africa ruled that phosphate from Morocco could not be shipped to New Zealand. The Court found that the Moroccan exporter in the occupied territory had no right to export such goods without Saharawi approval, nor had the importer right to purchase it. 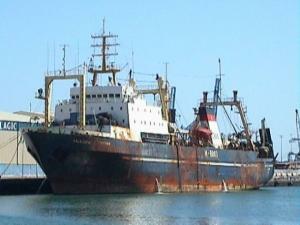 The case of NM Cherry Blossom lasted for 370 days from the controversial cargo was detained during a fuelling transit in Port Elizabeth, until the vessel was released. The South African court found that the trade of the conflict mineral violated the principle of self-determination established in UN resolutions. It referred to a decision from the Court of Justice of the EU in its argumentation. Now, an interesting sequence of events is unfolding: could the same scenario happen again? The Norwegian-owned reefer Green Glacier is currently steaming towards Cape Town - with a cargo that could possibly contain frozen fish from the occupied territory. The vessel is set to arrive in three days from now, on 26 January 2019 at 01:00 in the morning. There is still a little uncertainty whether the vessel indeed carries cargo from Western Sahara, but Western Sahara Resource Watch considers it likely. If carrying frozen fish from Western Sahara, the principle of self-determination has not been upheld. It would be the first known incident of a vessel entering South African waters with goods from Western Sahara after the High Court ruling. Not a single vessel carrying phosphate from Western Sahara has even rounded the cape since that decision, which according to court documents cost the operator a daily 10,300 USD for over a year. Green Glacier (IMO number 9004401) picked up a substantial volume of fish from two large pelagic trawlers and a fish factory vessel, just off the town of Dakhla in the occupied waters from 23 December 2018 to 4 January 2019. The loading of the cargo is clear from the development of the vessel's draught - how deep the vessel lies in the sea. The fish in question is caught under the fisheries agreement between Russia and Morocco, in which the representatives of Western Sahara have not had a say. Irrespective of whether the totality or part of the cargo is still onboard, the transport of the fish out of the occupied territory has taken place without permission from the Saharawi people. The article continues below the illustration. Aleksandr Mironenko at harbour in Las Palmas, in 2011. From 1 to 4 January, it anchored next to the Russian trawler Aleksandr Mironenko (IMO 8607177). It departed Dakhla port at 4 January 19:00. 14 hours after departure Dakhla, the vessel registered a change of draught to 7 meters. It arrived Cape Verde on 6 January at 16:00, still with a draught of 7 meters. Green Glacier was then located on 6 and 7 January in the proximity of the oil tanker Cipreia (IMO 9449209) where it picked up fuel (and maybe took on/off cargo? ), before leaving Cape Verde on 7 January 00:30 in the morning. 1,5 hours after departure, while underway to Tema, it changed draught to 7,5 meters. The following day, while still at sea, and seemingly without being near other vessels, it again changed draught to 7,1 meters. The vessel then arrived Tema, Ghana on 12 January at 08:47, docking at position 5°37'50.89"N, 0° 0'51.12"E. The draught was then 7,1 meters. 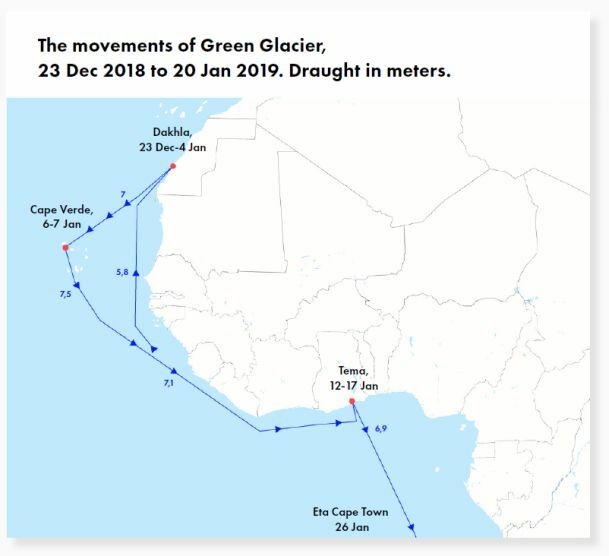 Five days later, Green Glacier departed Tema port, with a draught of 6,9 meters, heading towards Cape Town, where it is set to arrive at 26 Jan at 01:00 in the morning. There are several unclear aspects relating to this chronology. Most importantly: what happened in Tema port, Ghana? After five entire days in Tema port, the vessel only changed 20 cm draught. This means, most likely, one of two logical scenarios: that either very little of the cargo was discharged, or that some or all of the cargo was replaced with another cargo. Is it probable that, during 5 days, it had time to offload the entire cargo from Western Sahara, and replace it with a completely new one? Only an inspection in Cape Town can establish that fact. WSRW on 23 January alerted local harbour authorities about the arrival of the vessel, requesting an inspection to be made. The South African government has repeatedly stressed the importance of its High Court NM Cherry Blossom decision, including in the United Nations. South Africa for decades used to occupy the non-self-governing territory of Namibia, and has had a very strong position on the conflict post-1994. The foreign affairs minister of South Africa pronounced his country's support to the Saharawi people as late as this week. Technical details about the vessel can be found on the website of the company Green Reefers. Its so-called 'net-tonnage', cargo capacity, is 3.149 tonnes. To compare, the refugees from Western Sahara, living in refugee camps in Algeria, receive one can of sardines a month, in total around 900 tonnes a year. Green Glacier is, in other words, able to carry a volume that is more than three times as large as the one donated yearly in the form of fish by the international community to the owners of the cargo carried onboard the vessel. The shipping company Green Reefers has over the years been repeatedly challenged in Norwegian media over the matter. "Every little small private Norwegian company cannot make foreign affairs policy", company's owner Kristian Eidesvik told a Norwegian newspaper in 2010. "What is your comment to the claim that the income (of the business) ends up in the pockets of the Moroccan occupying power, and thus makes the situation worse for the Saharawis", the Norwegian paper Haugesunds Tidende asked Eidesvik in 2010. "I have no opinion about that", Eidesvik responded. "I do understand that Western Sahara is not the world's most favourable place to do business, but I do not think it is worse there than elsewhere", he stated. The Norwegian Seafarers' Union in 2018 asked Green Reefers to terminate the transports. 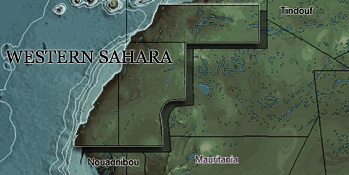 The Norwegian Support Committee for Western Sahara in 2009 requested the company to halt such practice. Western Sahara human rights defender Aminatu Haidar as early as 2007 critizised Green Reefers for "theft" in Norwegian media. The vessel is operated by GreenSea Chartering BVBA in Antwerp, Belgium. Manager is Green Management Sp z.o.o in Gdynia, Poland. Both the vessel Green Glacier and the company Reefers is controlled by the Norwegian company Caiano, which is also behind 35% of the Norwegian shipping company Sjovik which is operating under Moroccan licences in the occupied territory. The ship is insured by the Norwegian company Skuld. The Norwegian Support Committee for Western Sahara confronted Skuld regarding its insurance of vessels that transport products from Western Sahara. "Our members (owners) must, themselves, follow the rules and regulations that are applicable for shipping wherever they operate, and their coverage can be withdrawn if they engage in illegal sailing". Skuld's Senior Vice President, Marketing and Communication, Mr. Henning Bjune wrote the organisation on 17 September 2018. "How does Skuld assess the risk that the principles of the EU court of Justice be applied by national courts, as has been done in South Africa? ", The Norwegian Support Committee responded. The insurance company answered that it did not want to discuss particular conflict areas. It is thus not clear whether Skuld will cover transports carried out in violation of the principles established by the EU court. Other Skuld members have issued statements that it will not engage in such transports. WSRW on the morning of 23 January 2019 requested information and comments from the CEO of Green Reefers, Mr. Eivind Eidesvik, on the matter. WSRW also briefed the insurer Skuld.